Take it in your stride! Jog Derbyshire groups are friendly and help support beginners or those getting back into the groove. JOG Derbyshire is a countywide project which aims to encourage people to become fitter and be more active by starting to jog on a regular basis with people of similar fitness levels. Anyone who is new to jogging, or has not run for a long time, can be guided through a series of gentle walking and jogging programmes led by a qualified Jog Derbyshire Leader. The emphasis is on having fun and making new friends with people of similar fitness levels. Tell us why you love Jog Derbyshire on the #MyJogDerbyshire page. JOG Derbyshire Coordinators Lucy Bartles and Cat Wynne are establishing a network of community based jogging groups and you can use our online group search to find those closest to you. Monthly jogs for all ages and abilities are regularly held in the grounds of National Trust properties at Kedleston Hall and there are a host of featured events to get involved with. 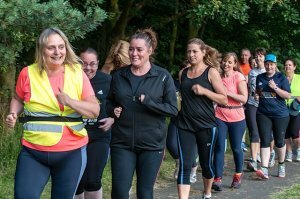 Meet some of our jog leaders and jog groups, and find out how joining one of our friendly jog groups could change your life! JOG Derbyshire is part of the Active Derbyshire campaign overseen by Derbyshire Sport, and funded through BIG Lottery, Sport England lottery funding and Derbyshire County Council.